Traveling is hard enough. When you add a sensitive child into the mix it can begin to feel impossible. Whether your child is highly-sensitive, neuro-different, or simply struggles to communicate his feelings, you know that a little extra attention to detail ahead of time can make all of the difference. 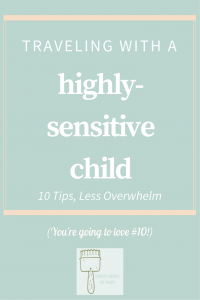 Here are my top 10 tips for easing travel overwhelm, for both you and your child. 1. Prepare for discomfort: Highly-sensitive kids tend towards discomfort and overwhelm. Bring comfort items like your child’s favorite pajamas or cuddle toy. The last time we traveled my daughter insisted on wearing pajamas THE WHOLE TIME. It drove me crazy but I took a deep breath and remembered that it really wasn’t a big deal, plus it made the difference between her relaxing and engaging, versus going off the deep-end. Did you hit a melt-down and you’re at the point of no return? Here’s how you’ll through it while staying connected to your child. 3. Keep your child fueled: Stay on top of hydration by packing a refillable water bottle. Keep snacks on hand. Stop for meal breaks at regular intervals, to minimize the impact of those blood-sugar crashing treats we love to eat on vacation. It’s also worth it to bring or purchase food that you know your child will eat. Peanut butter sandwiches every day? It might drive you crazy but if it helps your child relax and engage, it’s worth it. 4. Be open to shifting your routine: You may find more success with dropping your usual routine and getting on the schedule of the place you visit. When we travel to see our family in India my daughter does much better following their rhythm of waking later and going to bed MUCH later than she does at home. You’ll know quickly which will work best, your regular routine or a shifted one. Just pick one and stay consistent. 6. Role-play a few simple greetings: Especially if you are visiting a place that primarily speaks another language it’s helpful for your child to know a handful of appropriate responses. For some kids this could simply be an extension of the communication skills you’re practicing at home, such as making eye contact; for others, it could be learning phrases in the language of the place you are visiting. This can ease a lot of discomforts and help your child stay engaged. 7. Avoid relying on electronics: Instead help your child engage with her environment, as well as how to take restorative breaks. I’m not going to lie, this is a lot of work and sometimes the iPad is the only thing that will keep your sanity. But think of it this way, you are probably already working on this at home and the shift in routine and place may be just what you needed to introduce some new habits. When you do use electronics, do so within a predictable and consistent routine, such as after lunch for 15 minutes and then it’s time for rest. 8. Accept help from others: Even if you are traveling to a place where you know no one, there will be people who will offer you a hand. Take it. 9. Expect the unexpected: The only thing you can really count on is that things will be different. Let your child know this up-front. Make a game out of it. The game-changer will be how YOU respond to the unexpected – if your responses are predictable and you see it as a fun challenge, then your child will barely notice that things are different. 10. Remember your own self-care: ALL of the tips above apply to you, too! When we’ve got kids that have a hard time dealing with change, it’s easy to spend all of our time anticipating disaster. Here’s what I know – if you can keep your calm turned on then your child will be less on edge. So, it’s worth the time and energy to make sure YOU are getting what you need, and that you have time for rest and for fun. 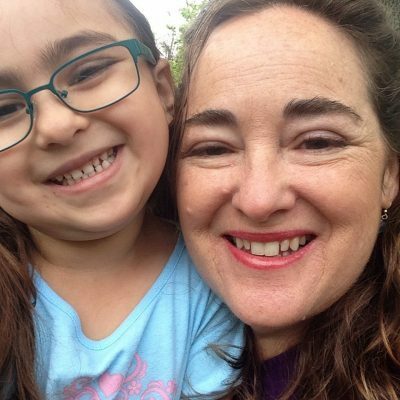 Want more tips and tools for mama self-care? You can find them here. What would you add to the list? Do you have any magic tricks that create more ease and connection while traveling? Share in the comments below!